Here is a little photo-session of an abandoned city. When the Soviet Union collapsed, government didn’t have much funds to support some small cities around strategically import objects. People of these cities were left all by themselves. Nobody could support them because any communication with this places terminated after the army decided that they now don’t have money to support those objects. People had to leave their places and move. Some were lucky to find their place under a sun of the Army of new Russian Federation, some less fortunate had to leave such places without any hope to find a new home, just because the shops stopped working, water stopped coming out of the facet and nobody cared about them any more. It has been said that even president Putin was thinking to retire from KGB in 1990 and go to work as a taxi driver. Many people are now probably express great sorrow that he changed his mind at that time. Just imagine how magnificient those buildings were before abandoned. 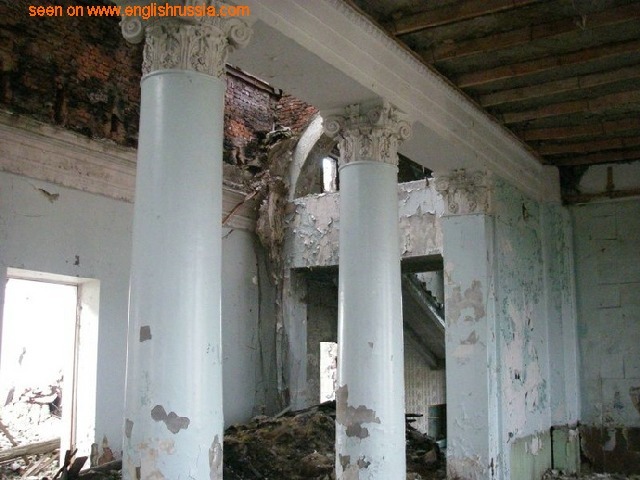 some buildings had pillars styled by the top Soviet architects. Areas and yards around houses are now covered with grass wich found its way through an asfalt and concrete. You can clearly see the grass here almost destroyed the paved roads during the last 20 years. Big buildings but nobody cares. Nobody needs them. And unknown structures whith domes covering them. This is a cloths shop, there is still a sign “Cloths” on it. …and trying to sit at those desks. …but the ghosts can’t play, they only pass thru them on their way to infinity…. “Native Language”, who might be interested in Native language now, and what is native language for them? Maths is off no interest also, no new mathematical genius, future solvers of Perelman conjecture, would study here… Only on twilight ghosts appear passing by the classrooms, just because school should not be empty. Russian classics on the walls are the only company for the wandering ghosts. They have to mind the distance while their midnight talks or they easily come through the wall on which writers dwell. And that’s another building that was visited by a photographer. 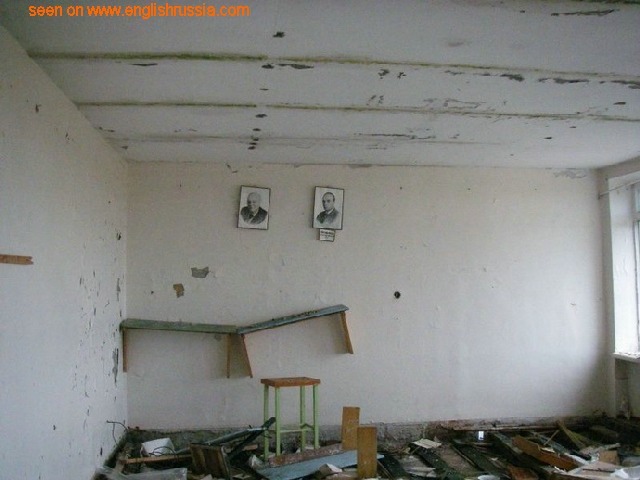 Here those students lived in happy families together with their parents. In luxury appartments, spending their cold evenings in the reliable shelter of those houses. Surrounded by green grass lawns. Starring on the stars from their penthouses. Oh world where are all those people now? I really like these photo essay posts. Very interesting pictures and I enjoy the commentary. Very interesting, but it still looks nicer than Detroit. i hope you were joking because i bet you have never lived in a soviet country. in my old village in Kazakhstan, we had water all the time during the soviet union. i visited back June 2007 and some of the houses were deserted, the roads were messed up, and there was barely any flowing water. Of course he wasn’t joking, that sounds exactly like Detroit! Can you tell us the NAME of this city? Nowhere is it mentioned in the article. 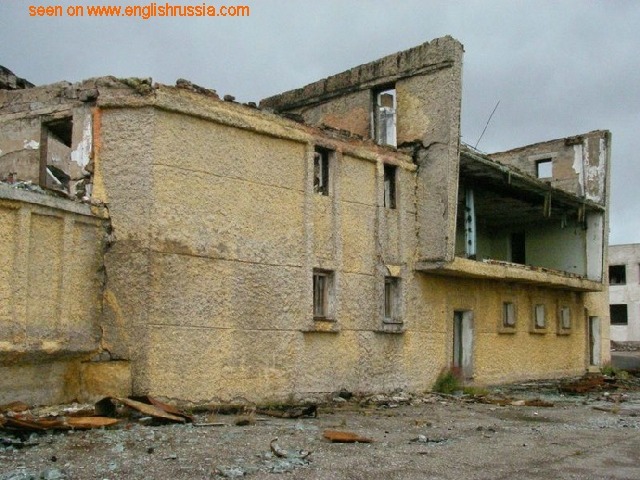 This could just as easily be a collection of abandoned buildings from around Russia; heck, half of them could be from nearly anywhere Europeans live. And what does Putin retiring have to do with it? The town is a group of settlements just north of the infamous Gulag camp of Vorkuta.These camps had schools and other admin as well as residential accomadation.I would guess that when the camp system clapsed the people would have returned to the cities,although Vorkuta still has a population today. 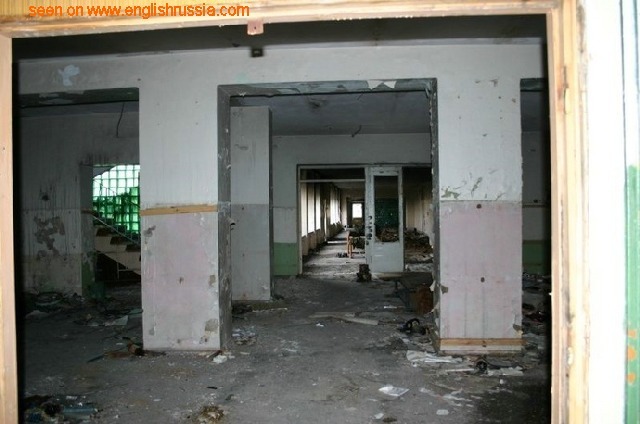 You must be blind mate….look at the end, it says Promyshlennyi, Vorkuta Province. RUSSIA….and Putin has a hell of a lot to do with it, he’s supposed to BE IN CHARGE…you must be an Amerikan! Seems every 2-3 weeks somebody posts crazy cool pictures coming out of Russia. What is the name of this city? Where is/was it? Nicholas, your lack of knowledge is terrible. 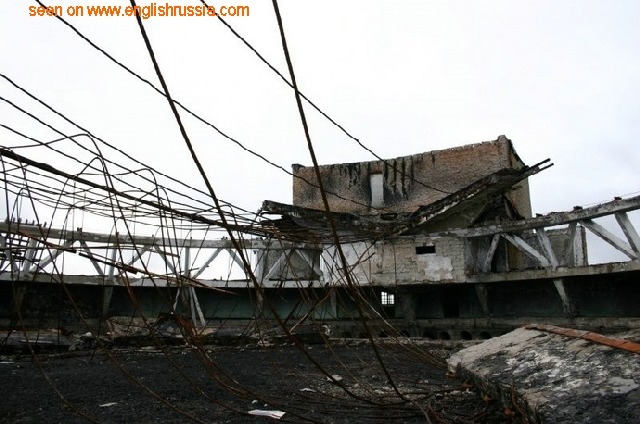 It wasn’t Chernobyl but Pripyat – town located next to the Chernobyl Nuclear Power Plant. It was evacuated 27th April 1986, the day after the catastrophe took place. 49.000 of inhabitants had to leave their homes. 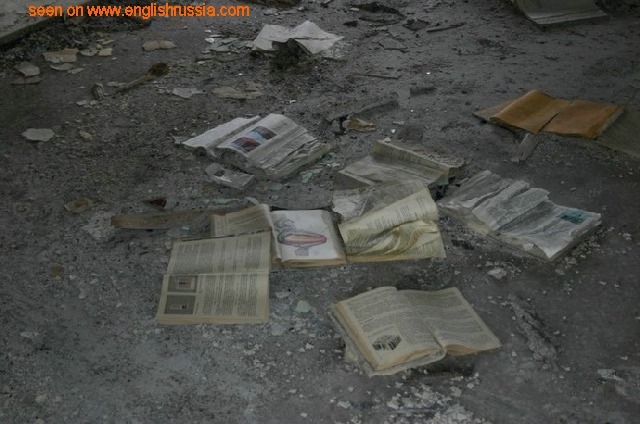 But Pripyat is IN UKRAINE and here is clearly said that the pictures above were taken IN RUSSIA. Can you see this slight difference? Just wondering, why don’t people reclaim areas like this and farm? I know that people used to pump their own water, raise cattle and chickens, enough to live off at least. I suppose it would be necessary to have trees around for wood (heat), but you could probably live for a couple winters just burning stuff you find around town. Or is there just so much open farmland in Russia that something this far from civilization isn’t worth it? Just curious. Here in America we have no open land like this (Everything owned by greedy rich people) and a lot of people without homes who might be able to make use of something like that if it existed. Bill you are wrong if you want to see wide open expanses of un owned land in america I suggest you travel west , their is much open unowned land in Kansas, Nebraska, Wyoming, Idaho, North Dakota and South Dakota, you might want to get hold of someone within the department of the interior, you might even find there might be government programs still offering people land in those areas if they are willing to farm it and stay on it for a number of years. Only problem with this is those areas have extremly harsh winters and one must have everything they will need to live through the winter put up before the end of September when the big snow begins to fall and the polar winds slices through to the bone. These were not cities in the way you normally think of cities. Normal cities grow up organicly over decades or centuries around a certain area. Those kinds of cities don’t need “funds to support”, and have a strong enough economy and enough social cohesion that they will never fully disapear. For example, someone mentioned Detroit. Detroit might have lost much of it’s population after the decline of the U.S. auto industry, but is still has a population of a million people, and a standard of living much higher than cities in Russia, Eastern Europe, or the Caucasus. You continue to amaze me with absolutely amazing photographs. Keep up the great work! we like to think that our cities will stand the test of time and be there as memorials, but as these pictures show, nature Will reclaim the land if we don’t work to preserve our spaces. Why there is no name of the city? Is it officialy closed or something? Nicholas, would you please stop telling people that? This is NOT the abandoned town of Pripyat, Ukraine (the town near Chernobyl which WAS abandoned due to the nuclear accident). 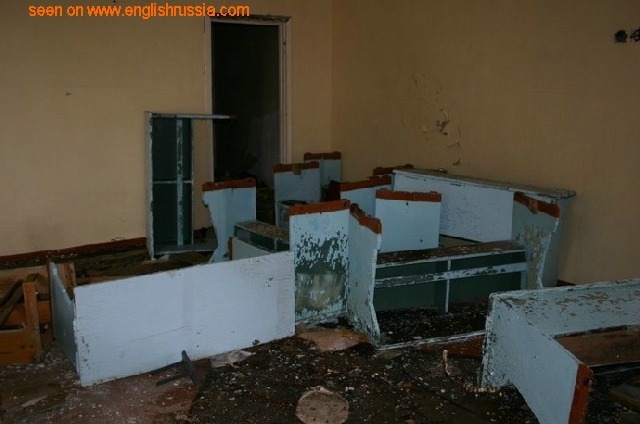 These photos are of an abandoned town in Russia named Promyshlennyi. Ack, ugly architecture, insipid photos and laughable and trite commentary, could you be any “sappier”? Мудаки вы, Англичане. Хуйню какую-то порете. wow that is amazing. I would love to visit that place. I absolutely love abandoned places. All I said is that it looks nicer than Detroit. Check out these photos to compare… and while you’re looking at these pics bear in mind that this IS America… then ask yourself which looks “nicer” the above pictures of Russia, or the ruins of Detroit. Did you take these photos? If not where are they from? What’s the city called? In what region is this? “It has been said that even president Putin was thinking to retire from KGB in 1990 and go to work as a taxi driver.” Where’s the source for this? Some interesting pics. Try and think of someone worthwhile to say first. Then look up how to spell the words you mean to use. This looks like North Philadelphia. Interesting photo set. Reminded me of Halflife 2. 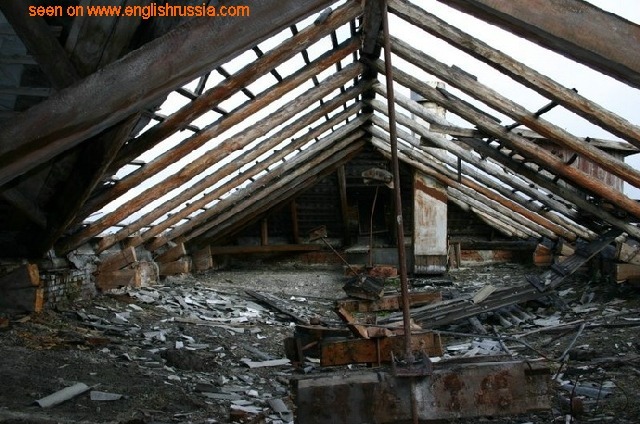 Its hard to see that the building fell apart just through neglect, was there some demolition as well? Could the name of the city happen to be “tshernobil”? Dear Moi, learn geogrphy! 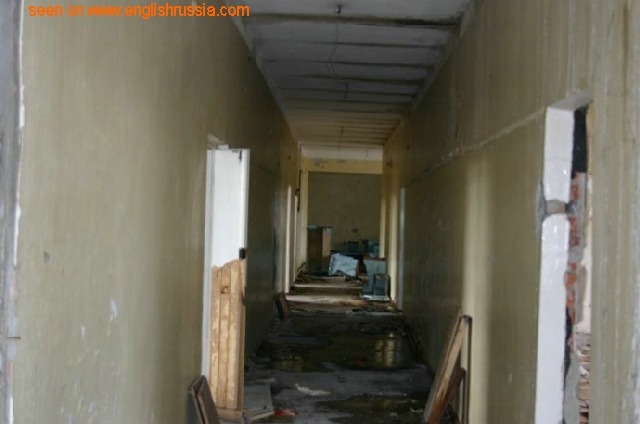 Chernobyl is located in Ukraine..
Judging by the stepe around, these photos probably taken in Kazakhstan, not Russia. thank you!! finally someone who realizes! They should dismantle and sell the architectural details abroad. Top dollar for some of that stuff. The unknown semi-circular building is most likely a radar dome (or at least the base of one). The dome likely collapsed or was demolished to retrieve the dish itself. Even more desolate than Chernobyl. Awesome, awesome pictures. You’ve got my digg! A very stark illustration of how centralized economic planning did not work. I would agree with czqsbp – these buildings must have been very shoddily constructed for them to decay to this point after 15-20 years. Detroit has buildings that have been vacant and unmaintained for 40-60 years that are still structurally sound and could be renovated if the money and will was there. Sad to see buildings this “young” falling apart so badly. Bill, thanks for the link to those flickr sets, too; I’ve been exploring them and they’re awesome. But I would have to disagree on the Russian buildings looking better – half of these downtown Detroit buildings could be rebuilt. 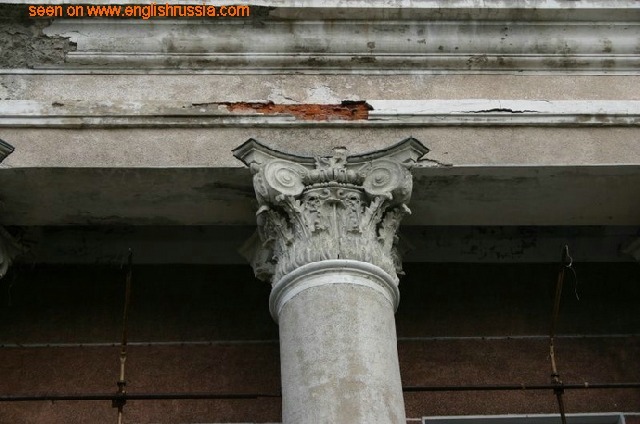 Most of the Russian buildings have obvious and severe structural problems. Perhaps my perspective is different, though, having done numerous renovations of older buildings. 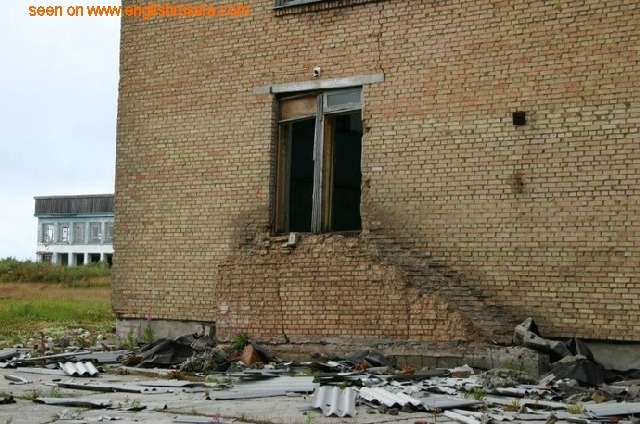 There are key things that can cause a building to be a hopeless case – the Russian ones all exhibit one or more of them. Sinking foundations, major cracks in the masonry, masonry decaying to it’s original elements (sand and rocks), etc. Once that happens, you’re either going to have to disassemble and re-lay the brick walls or else tear it down and rebuild. You can guess which one is cheaper and more likely. I thought for sure that these were really going to turn out to be pictures of the American south, a year after Hurricane Katrina. From the description at the top “some less fortunate had to leave such places without any hope to find a new home, just because the shops stopped working, water stopped coming out of the facet and nobody cared about them any more. The pictures are facinating, but what makes the poster of this gallery believe that its the government’s job to “take care” of the people in the first place? This is a classic example of why Socialism and Communism don’t work. The people living in this town were depending on the government to take care of them everyday. Because of this, when the government collapsed, the citizens who ALLOWED themselves to be dependent on the government suddenly had to become self-sufficient in order to survive. These pictures are not a “sad reminder” of a once-occupied town, they’re a STERN warning of what happens when the people ask the government to take care of them so they don’t have to take care of themselves. And I am sure that you are not dependent on ANYONE for food, water, electricity, medical care, clothing in your isolated hermits cave ? Cut oil imports by just half in the USA and you will see some of the same effects. Gated “communities” in Phoenix, where homes now sell for $1+ million will look much like the photos (sans grass of course) if US oil imports are cut by half. I hate reading the complaints about the comments between the photos unless you could do better in a language not your own. They were obviously written by a non-native speaker of English. Native English speakers, is your Russian this good? Doubtful. It seems obvious that misused words like “penthouse” are innocent mistakes. 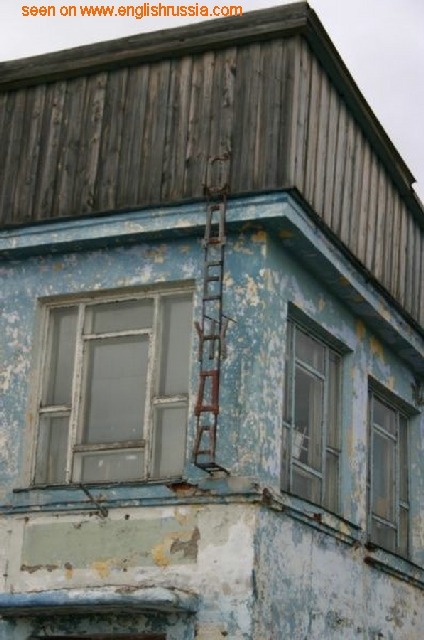 It is easy to imagine looking up the Russian word for “attic” in a dictionary, or asking someone for the English word for the room at the top of an apartment building, and getting “penthouse” instead. Cut the writer a break. Perhaps you should take your own advise. Notice how I spelled advise instead of advice? Funny? That place would make a great training area for snipers. Reminds me of the Zone in Tarkovsky’s ‘Stalker’. Re: comment 9 about cities never disappearing, there’s quite a lot of examples of such around Europe, Old Sarum in Wiltshire, England perhaps being the first to come to mind. Wicked, I my last post was number 69! Sixty Nine DUDE! Hey it’s me again: Mobo. I just changed my name to Melrose. I wanted to add that the commentary is what made the photoset interesting. A bunch of photos is one thing, but reading and imagining the story that drives the reader through the series is key, and this one has it. News flash, Bill! here in America we do have open land, we do even have abandoned towns, and everything isn’t owned by greedy rich people! Towns sometimes die for a variety of reasons – environmental, economic, or even political. Please broaden your horizons a bit and realize there is a world out there that you may not be familiar with! It is true to some degree; however, that the richest Americans do own most of everything. Both here and there I don’t appreciate that the narrator sees it’s necessary to tell us how sad the pictures are, implying that we’re heartless monsters who can’t feel without the prompting of an affected native. Consider me greatly offended. They talk about ghosts. Who died? 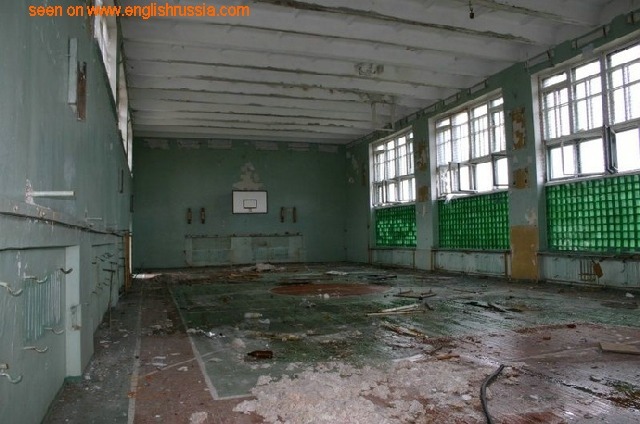 It isn’t Chernobyl but they must wish it was because aparently some people can’t miss an opurtunity wax poetic on pictures of abandon towns. I think the person who posted the photos was trying to convey a sense of sadness with a side order of humor to lessen the feeling of dread that comes upon as we view the photos. Personally, it didn’t look like much of a thriving town to me. Where’d the roads go and most importantly, where are the people now? It’s truly sad that these people had to abandon everything, but as the poster stated, they were virtually abandoned with no running water, etc. Therefore, they didn’t really have a choice as to whether or not to stay or leave. If they chose to remain living there, I don’t know how they would have survived. Hopefully, they are living much better lives than their previous ones in this town. Regarding, someone’s comment stating that this is what happens when you live in a Communist society–so true, so very, very true, but these people have a different perspective that we, as Americans, fail to understand, so it’s easy to criticize them for their governmental policies, but that’s their way of life, unfortunately. The idea here is more of that of an introduction to the possibility of potential things. Some of these comments I’ve read are without that which they contend, but rather. Furthermore I for one would only hope to state the clearer picture, and listen to the more hidden constructions of testimony so laboriously delivered by Charles. Thus I think it’s clear you’re begging the question and I would strongly urge you to pertain only to the aquisition of these such Russian scenarios. finds this place on the map. It is North – behind the polar circle. It explains the absence of the trees and damage to the dwellings. 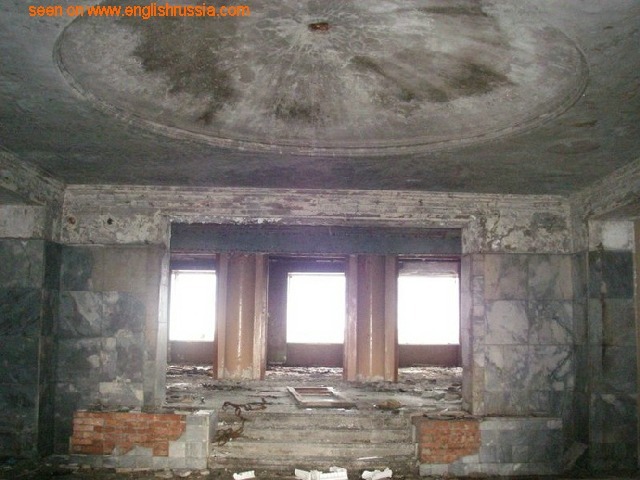 Please note that pictures show the evidence of demolition process (lack of doors, windows, metal railing, etc) – so people took with them what they wanted when they left that place. Thank you. I have always been fascinated by things lost and then found. I wonder where the builders and inhabitants are now. Your photo essay and commentary are very moving. The name of the settlement (not a city, not even a town!) is written below the pictures, next to photographer’s name. It is Promyshlennyy (which in Russian means “industrial”), an outskirt of Vorkuta, in the Republic of Komi. In its full gloom it hardly had 9000 inhabitants, the whole economy being coal mining. Pechora coal bassin used to be very important in the past. Pechora coal mining was developed when Donbass was captured by Germany, and helped the USSR to defeat Fascism. Today, coal mining in that area is completely pointless. With no other means for living in the harsh Northern climate, several minor settements were abandoned. The list of comments is very nice. It is a list of so Westernly cretinic speculations on the themes of huuuuuuuuuuuuuuuuuuuuge terrrrrrrrrrible Soviet army which was (of coooourse, it was, how dare you doubt?) supporting whole large cities, on Communism, and all the stuff, which, even if existed in reality, would be completely irrelevant to the town in the pictures. Vorkuta (Russian: Воркута́) is a coal mining town in the Komi Republic, Russia, situated just north of the Arctic circle in the Pechora coal basin, at 67°30′N 64°00′E. Its population as of the 2002 census was 84,917. It had its origin in one of the more notorious forced labour camps of the Gulag which was established in 1932. In 1941 the town and the labor camp system based around it were connected to the rest of the world by a prisoner-built railroad linking Konosha and Kotlas, and the camps of Inta. Vorkuta became a city on November 26, 1943. 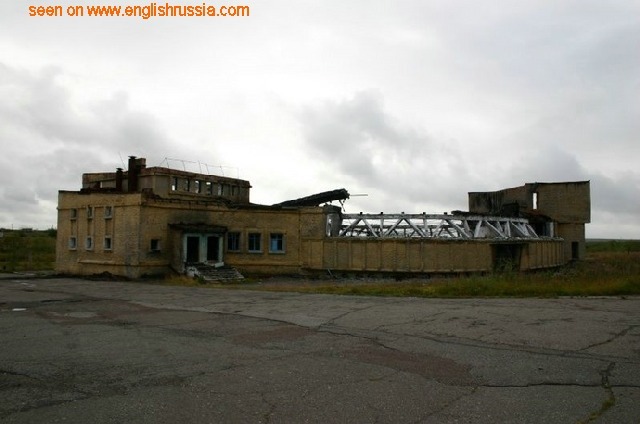 It was the largest centre of Gulag camps in European part of the USSR and served as administrative centre for a large number of smaller camps and sub-camps, among them Kotlas, Pechora, and Izhma (modern Sosnogorsk). In 1953 the town witnessed a major uprising by the camp inmates, in the so-called Vorkuta Uprising. After it, like other camp uprisings (see Kengir uprising), was bloodily quelled by the Red Army and the NKVD, many of the Gulag camps were disbanded in the 1950s. However, it is reported that some in the Vorkuta area continued to operate into the 1980s. By the early part of the 21st century many of the mines have been closed as problems with high costs of operations have plagued the mine operators. 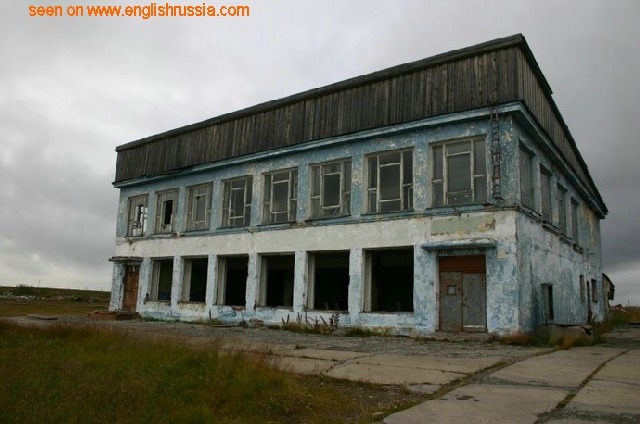 At one time during the late 1980s and 1990s there were labor actions in the area by miners who had not been paid for a year. .
During the Cold War an Arctic Control Group forward staging base for strategic bombers was located at Vorkuta. I was wanting to know more about this place. How melodramatic. 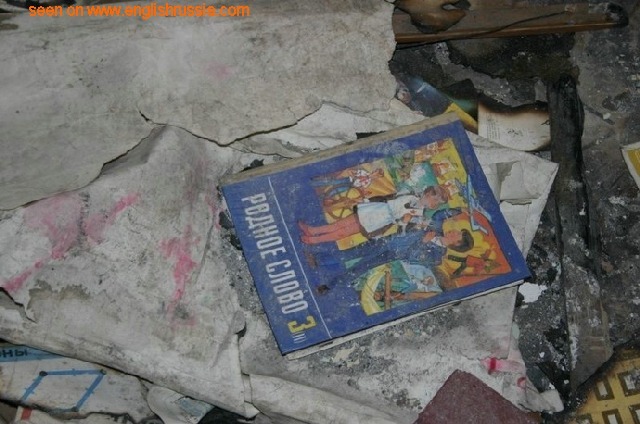 Even moreso than those photo journals that accompanied the return to Chernobyl on the 20th anniversary of that disaster. The people didn’t die here. 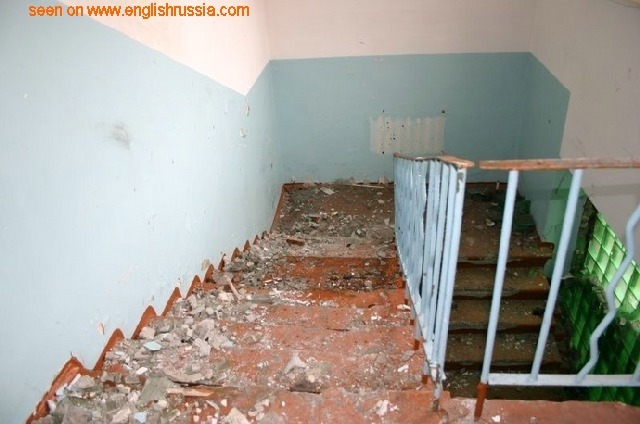 The residents just left.There are no ghosts of schoolchildren wandering those halls. They just moved somewhere else, continued on with life, grew up & are living & working elsewhere in the world. Asside from the commentary tho’, the photos are great. beautiful images. Sad that each and every one needed to be butchered with a mcdonald’s mustard yellow “seen on http://www.englishrussia.com“. 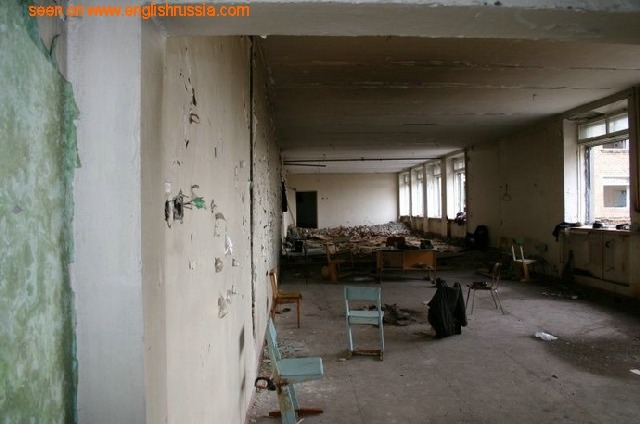 Some military bases (or some parts of the bases) in Russia look like in the pics. 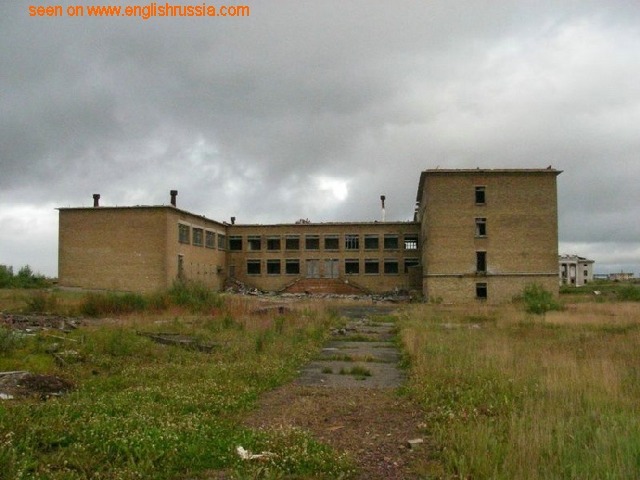 When I was on my officer military training, it was usual situation when you go through the forest – you can run into abandoned military buildings or abandoned military cars and equipment. In 1990-th they had no money for base supporting so they left some parts of the base. In the end, such reduced base could be disbanded. Today Russia makes new bases, so the situation is much better. No comment, I just wanted to close the italics that barry left open. Oh, and Don Lee, your tolerance is showing. Americans are pompous liars and ferocious bigots. I should know, I was raised here. Mr. Lee, it should be mentioned that you do not speak on behalf of the vast and overwhelming majority of Americans. In actuality your words show you to be misguided, misinformed and quite lacking of character and tact. If those words in your post are to be believed as being sincere. I’m a bit dubious since they are so over-the-top in their outrageousness. It comes off more as if it were a schtick from “The Onion” or “National Lampoon.” However to give you the benefit of the doubt, if the words you posted are your honest and sincere thoughts then you are a very bitter man who is in actuality the type of American you describe. This would make your comment fall more in the category of irony. Either way, your words are quite erroneous and therefore moot. 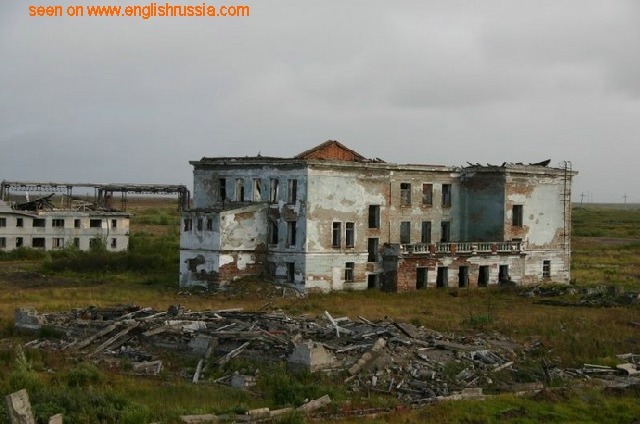 Personally, I have enjoyed reading the entries on “English Russia” and especially enjoyed seeing sites that most likely I will never see in person. I also enjoy the humor the author presents which is refreshing in the blogosphere. Asking for the name of the town is merely a way of gathering information. No more. No less. People are a curious bunch regardless of what part of the world from which they reside. Thanks to others who left comments, readers like myself will learn more about another part of the world we will most likely never have the opportunity to see in person. 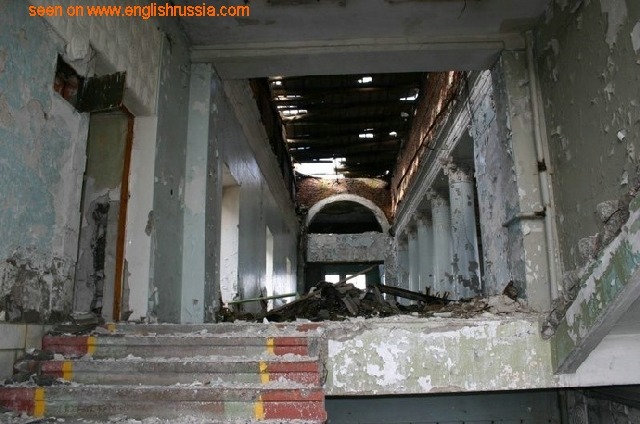 I made sure I put an entry about it on my blog because it is so interesting and “English Russia” as a whole is a very interesting blog in of itself. However, Mr. Lee, you are entitled to your opinion albeit it is one not shared by myself nor represented by the Americans you attempt to paint with an overbroad brush. Americans are pompous liars and ferocious bigots. I should know, I was raised here. The worst of the lot are the ones who try to pretend that they aren’t misogynist racist sedulous sheep, the ones who try to get on a moral ground and elevate themselves, and are full of misinformation. That’s VERY typical of semi-educated, leftist type americans to think they are above other americans. Therefore you defeat the purpose of your comment by claiming to be so different. It’s almost artistic. The pictures are really nice, I remember something similar about a small theme park in Japan. I always find Ruins to be fascinating, they remind us that something comes after we’re gone, nothing’s forever. What an absolutely stunning place. 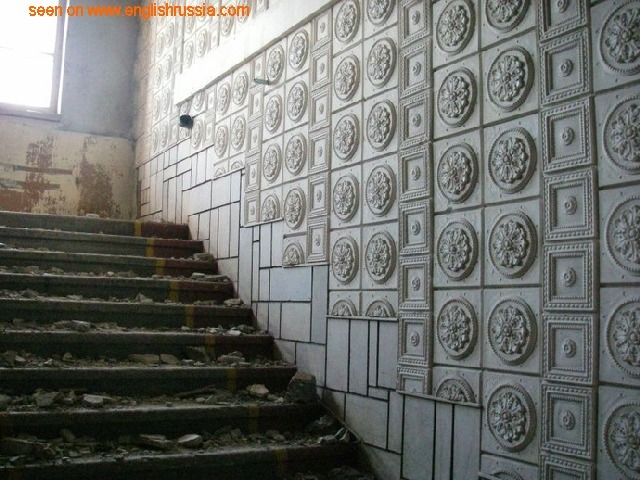 The tiles on that staircase in particular have so much detail. The commentary is likely some kind of Russian humor that doesn’t translate well. It’s my understanding that in Russian folklore old places are always haunted. In some old farmhouses there’s a tradition of leaving some small offering of food or drink in the attic for the ghost of the previous farmer. Ghosts in that tradition are not malicious. Sorry… I once took a Russian Folklore class at the University of Michigan. I agree with you; however, that Russian folkore is quite interesting as I never knew that! The corny captions could be in reference to some folklore, but the Putin comment at the top indicates an obvious agenda. It’s funny how so many people who don’t speak good english slaughter nuance and use a lot of thesaurus words when they try to propogandize in english. The have the subtletly of a chainsaw. They usualy don’t accomplish their goal and they do give us a good laugh instead. Great photos… would be amazing to go and shoot a post-apocalyptic movie there. “This is a classic example of why Socialism and Communism don’t work” from people that never been in the USSR sounds as same funny for us Russian residents as author’s bad language sounds for you.. One can’t have a comprehensive opinion about the country they never been in, as same as another can’t speak fluent a foreign language if they never had a good amount of verbal communication with native carriers of the language. Hey folks, this indeed is a great collection of photos. Liked teh commentary too. I wonder if all the people who posted there comments have actually observed properly.The name of teh town was given right under the last picture in teh series. P.S: I read an article about Chernobyl and in NGC magazine, they showed some pictures which almost were over lapping with the theme of thsi site. They were very touching. Half Life 2 anyone ?? What really interested me in these photos was not how quickly the buildings degraded, or the interiors looked vandalised, paint peeled, roofs fell in, etc., but how quickly the natural world started to reclaim the land. Grass and weeds growing over yards and roads; trees and bushes breaking down the foundations of buildings. How long before the buildings topple and there’s nothing left to see except by archaeologists? Zilch–“The pictures are really nice, I remember something similar about a small theme park in Japan.” Any idea where I can find those pictures? Did you see them online? As a separate point, I don’t know why some Americans feel it necessary to apologize for “the rest of America” and rush to reassure the world that we “are not all like that.” I understand there is no way to characterize even a small group of people, much less an entire country. I assume other intelligent people, in other countries, do, too. I’m from Russian, but from south part. Kuban. But in present time there is some kind of extremal tourism like “Base-exploring”. Some groups of people search for abandoned and strange places in our huge country. Such as these links. I have a big post coming tomorrow, so be sure to stay tuned. Palabra. The Shat hawks the Commodore: like a video game, but with a keyboard! I have seen this city in a book I read and the reason it is abandon is because of the Chernobel melt down and the radiation cloud that was created, in other words the place is hot. Come on, friends. At the end of the photos is the name of the town – Promyshlennyi, Vorkuta area – and the photographer, Oleg Shvets. The western U.S. is studded with ghost towns, none, I think, as elaborate as this one, and rural New England is full of the ruins of long-abandoned farmhouses, now surrounded by forest. If – when? 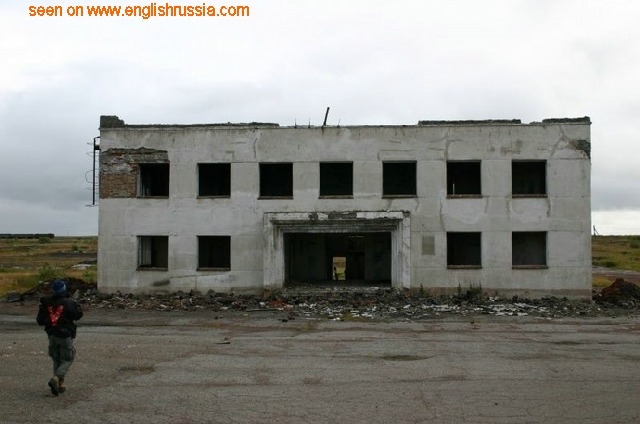 – the rest of the world forces the U.S. to pull its army bases out (there are some 700+ of them), there will be American equivalents of Promyshlennyi, except that they won’t be elegant ruins – just barracks, shopping malls, garages, etc. Great pictures. 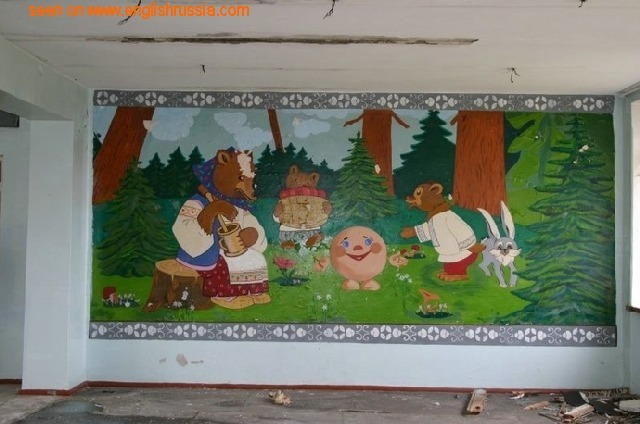 I really like seeing abandoned buildings but it’s so rare to find anything online from Russia. Thanks for posting these. It’s great to have a look at other architecture and cultures. just north of the UFO landing pad you recognise is a UFO crash site. It appears as if the aliens have nearly completed reconstruction of their craft. Вы в HALF-LIFE играете, мы в нем живем. le monde est un grain de sable. Stalin built these cities around ‘combinats’ central factories- that were linked across the soviet empire. He did this so the truck factory in republic X was dependant on the tires from republic Y and the wire and cables from republic Z. The Factory and City were inseparable- for example waste heat from the factory heated homes. 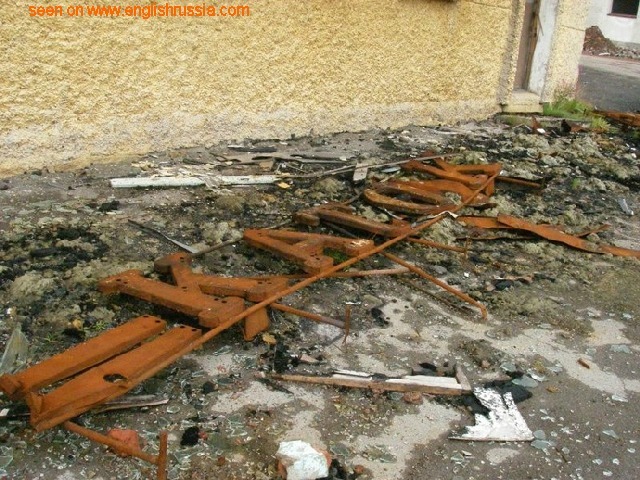 The town’s trolley cars would be maintained in the factories workshops. When the factory went down, everything stopped. I have a friend that regularly goes hunting in the regions surrounding Moscow – places like Tverskaya Oblast, an area the size of Ireland with less than 1.5 million people. He was there over the weekend and told me that there are many abandoned villages. People are moving; Russians are fleeing dictatorships in central Asia, they are leaving the far north and the far east, and they are leaving small towns (many of which lack sanitation and most of which lack telephones) for regional capitals. The one place that’s growing by leaps and bounds is Moscow, where real estate prices rival those in New York or London. Could this be a city some place in Siberia? As many Military bases would have been in the far North during the cold war. It would have been a much shorter distance to fly bombers and or send Nuclear Missles into the U.S. during the cold war. First, let me invite everyone to Detroit for vacation. Go ahead, laugh. But there’s a lot of great things to do here. I would not recommend coming in the winter, though. Second, those sites showing Detroit’s blight (and much of it is still there) represent only a portion of the city, and NONE of the suburbs. More than four out of five people in the Metro live outside the City. Third, as to that exodus, please know that the “white flight” and urban sprawl began LOOOOOOONG before the (myopic) American auto industry went into decline. In fact, I think it could be argued that they are both the result and symptomatic of a mentality that does not believe in preservation. But that is beginning to change here, thank goodness. Now you can stand over the bowl and have the cream-of-wheat float UP your pants legs. By the way who cares about those cities. You people are responsible for all those ghost towns. Think about it; its your demand for things you dont need that made chernobyl, herosima and nagasaki.. So dont go: oh.. in feel sad.. these cities.. oh.. im going to cry now..
Promyshlennyi, Vorkuta area – thats the name of the Place..
Now you can walk really fast and leave a splattered trail of cream-of-wheat. Ah, yes! Perchance to dream of cream-of-wheat. What is the deal with the cream-of-wheat references here, people? It’s a maelstrom. And I think that says alot, not sure how but I really like the way that word rolls of the tongue. So I’m leaving you to talk amongst yourselves about the validity of the building reconstructure and the adaptations to a society which, case in point, allows me to rest mine. Never before or after which it was, that being said, “the city of wrecked abandon”. Does that shine a light on anything? No. And there you have it. Classix, that city is almost as abandoned as your head. I can’t remember if it was sixth, seventh, or eigth grade, but Laura had this one beak that she formed from aluminum foil and covered with American flag. She held it to her face and called it the, “Patriotic Beak”. Genius! Classix, you’re not going to have the last word. Вы в CREAM-OF-WHEAT играете, мы в нем живем. I’m not gonna lie to you, I spend hours on this page, and I visit it frequently. It’s probably my favorite place on the Internet to hang out. You Americans admire abandoned and haunted city. In Soviet Russia, abandoned and haunted city admires YOU! Happy Halloween, abandoned and haunted city! An incredible photo essay , thank you so much for making it available to view! I can draw a turkey by tracing around my hand? I can draw a turkey by tracing around my hand. I can draw a turkey by tracing around my hand! U.S., get it. Then keep it as, “whatever”. And then some. Positivity. This is how. Here he is, he likes it here. Willie Johnson, youtube. Happy Holidays, abandoned and haunted city! Wow, for some reason that whole picture set was very sad. It reminded me of some of the ghost towns I visited in Nevada and New Mexico. Many of them were abandoned mining towns that died after the mines became unprofitable. what was the name of this city anyone know?? somebody have news about ancient abandoned cities of Russia or Central Asia lands. Also, there is now, in this moment some cities threatened in spite of being left or to become depopulated? I see the same question all through the comments “What the name of the City”. To me, It’s written under last pictures. “place: town Promyshlennyi, Vorkuta area “. The name of the town translated as “Industrial”, the location is Vorkuta region. http://ellabari.livejournal.com/46396.html — comments of the girl, who lived there when a child. very sentimental. 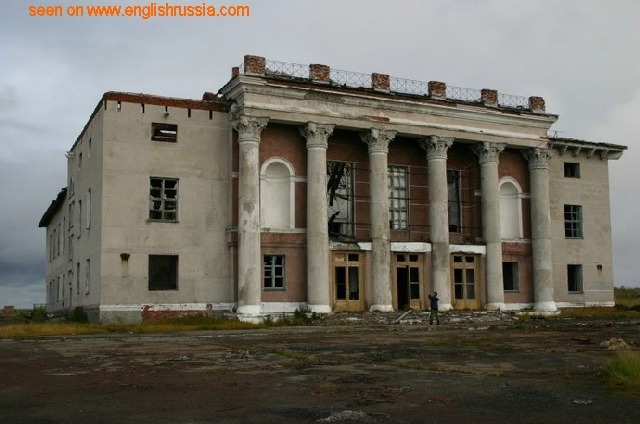 the building with columns is a recreation center, ‘Palace of Culture’, where was cinema, amateur concerts ets. Ellabari says, people talked it built by political prisoners. ‘unknown structures whith domes’ is a skating rink. roof is falled. 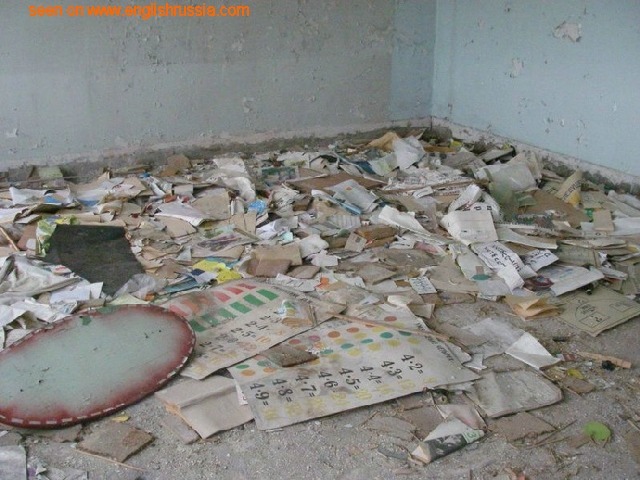 Ellabari remembers the room with boxes, where was skates for visitors, who don’t have own (second photo in her blog). 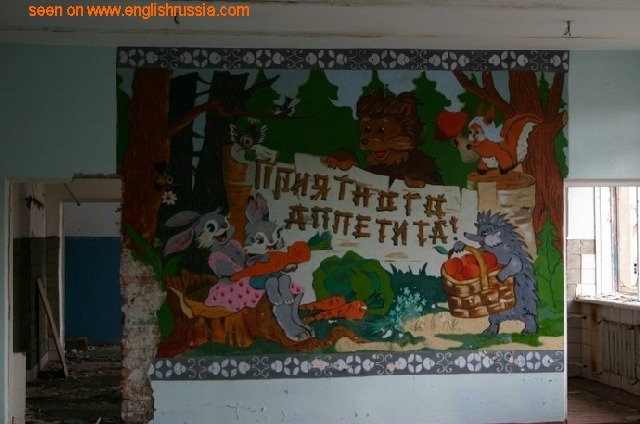 the walls pictured whith fairy-tale characters are in a school dining-hall. text on the wall says ‘bon appetit!’. I was told that there quit a number of these in eastern and souther parts of the country.. I really like all the complete gamma of textures you can find into the abandoned places. P.S. Have you seen pictures of Ohio Reformatory and Waverly Hills Sanatorium? They’re great abandoned places! Actually, I think the reason for everyone comparing the abandoned establishment to America is as a frame of reference. As to whether or not they’ve been outside of the US is mere conjecture, at best. 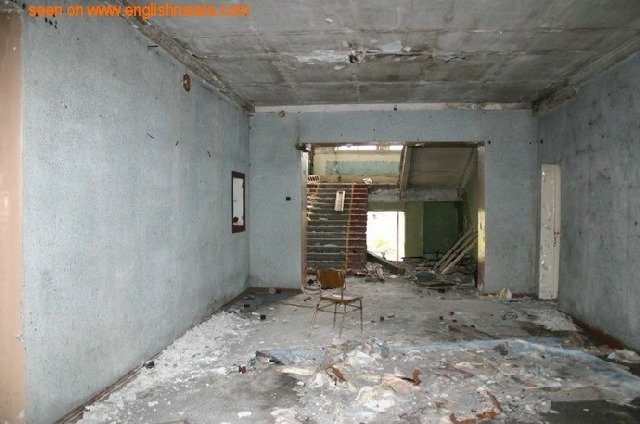 I do; however, agree with you that most people wouldn’t visit this abandoned place due to the simple fact that there’s no real reason to; unless, of course, you’re one of those English tv shows who likes to go to alleged haunted places and allow your imagination run wild with tales of mythological ghosts. Bottom-line: Great photos, but the comments underneath them are disrespectful to those who actually called this place, “home,” but ironically, delightfully amusing! Yeah, that’s my country. We love to build and destroy. It happens all the time in Russia. Your pics are amazing, comments are wonderful. Thanks! I’m sorry, my English is not very good. It’s not a city. 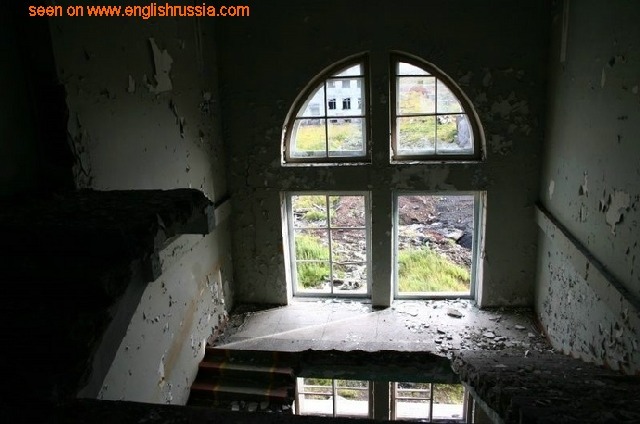 It is “Promishlenniy”, coal-mining village, not far from Vorkuta, in Siberia. Coal-mine is deactivate, by Putin’s goverment. Not work, not food, not good water, etc. People leaving this place and lost they houses and they life. Every year Russia lost about 2 millions peoples. Capitalists and our goverment killed our peoples, destroyed our towns and villages. Many people havn’t drugs, food, houses and work. Also interesting are the photographs of downtown Detroit and St Louis after the hurricane, why doesn’t the US government fix these things? Because America has a trade deficit of 33 billion USD, and is a dying superpower itself. 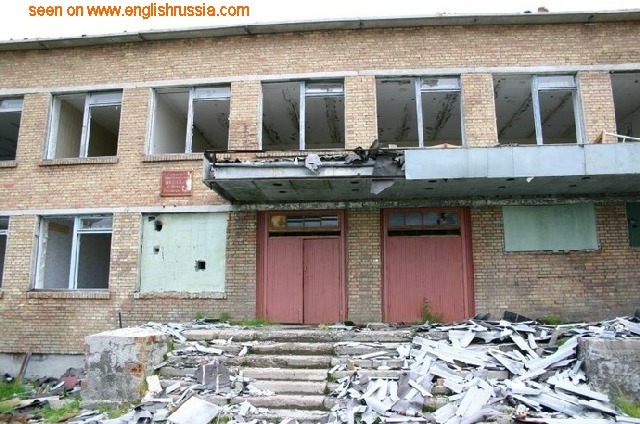 Ruined buildings are becoming commonplace in the USA, because they’re going the same way as the USSR did. The only difference is the US Govt. use the media to pull cotton wool over the eyes of the US people. What a steaming heap of poo! America may be the Evil Empire, but one thing they cannot be accused of is allowing infrastructure to crumble and decay like in Russia. Have you visited the northeast lately, or any of the ruins that used to be Michigan, Illinois, Ohio, Cleveland, New York, et al … ? Magnificent photo!!! Charming and full of spirit!!! Amerika in 20 years…..you could call this masterpiece life after King George II….Hail to the chief! Hey there in 2007, how’s your hope and change going? What? Oh, sorry. I like this kind of thing, reminds me of the pictures of Chernobyl today. He’s obviously referring to New Orleans and the effects of Hurricane Katrina. An American’s ignorance knows no bounds and isn’t limited to just ignorance of another country. He probably caught a few glimpses of Katrina’s devastation on TV while trying to find the NASCAR race. Гг. Читаю и поражаюсь, что они несут. You can find satellite pics of that area, a mining district with lots of small towns/cities. The abandoned properties are clearly intended expansions of long existing close-by living and processing facilities. The Soviet collapse meant the bank went bust and these and many other investments went up in smoke. Kind of like the USA today. Does antone know where this place is? Se eu fosse prefeito dessa cidade eu a transformaria em uma nova york russa. Maybe young people would be interested to make a huuuuuuge party in such abandoned city as these one. It would be crazy. Just think abou it! 10.000 people in a town like the one in pictures getting drunk and crazy in that city. Maybe Ukraine would rent the city for a weekend? Photos were placed more then 2 years ago and last message was written 1 month ago. Then it’s interesting for our days too. First. My English language bad, excuse me. “Oh world where are all those people now?” So, those people are there now. My name is Igor. I live in Saint-Petersburg, in Russia. I’m 50 years old. I was born in 1958 and lived in Promyshlennyy from 1958 to 1975. I studied at this school of 10 years. Then I have left for Leningrad (Saint-Petersburg now), graduated from Leningrad University (mathematics-mechanics faculty) and work in commerce firm. Too, “Vorkuta” means “bear’s corner”. It’s strange, but more then 17 years I didn’t met at least one bear anywhere. But instead of bear – many lemmings (polar mouse), white foxes, polar owls and ptarmigans. Why I write “PromyshlennyY”? Because Russian transcription – ПромышленнЫЙ. All Russian words, which ends are “ЫЙ” have English “YY”. You can see on any Russian-English official topographic/sea map. For example: “The cape Northern” in Russian “мыс СевернЫЙ” and on Russian-English map I read “Mys SevernYY”. Promyshlennyy – that’s right, Promyshlennyi – that’s NOT right. However, this is small thing. Not small thing is that I lived there. Promyshlennyy in 1975: ~ 12000 peoples (95000 peoples in town Vorkuta at all), ~450 dwelling houses (1-floor: 2 two/three-room apartments = 2 families [they are absent in all photos!] and 2-floor: 8 two/three-room apartments = 8 families [at the left, Photo 05] ), 1 school, 1 music school (it’s my school too), 1 hospital, shops, 1 House of Culture (we proudly named it “Club”), 1 Skating Rink, 3 big football fields (70-80 m – they were fantastic huge fields for us) ), 1 restaurant, and many others. May I ask you a question? Why Promyshlennyy is dead? Soviet Army? No, and no once more. SA is absent in Vorkuta (and absolutely in Promyshlennyy). There are internal forces (few quantity, they guards prisoners) and police (5-6 person was in Promyshlennyy). May be radiation? No. I do not know any nuclear objects in Vorkuta and near, if only in our school in teacher-room. There is permafrost, average-yearly –minus 6,1oC, in December – minus 40-45oC. I remember max minus 53oC. May be because Soviet Union degraded and collapsed? You have not guessed right again! SU collapsed in 1991 and peoples began to leave Promyshlennyy in 1975-1977. “…any communication with this places terminated after the army decided that they now don’t have money to support those objects…” Excuse me, please, it’s full bosh, it relate to anything, but only not to Promyshlennyy and this photos! Communication with this place not terminated! The army not decided anything! Because army was’nt in it. In 1993 there were 17 (!) coal mines. In 2000 – 11 coal mines! There is only one reason, only. 90 percents of mans worked in the coal mine! Coal mine – three changing, twenty-four-hour. It is bread for our life. Then Black Coal came to the end in this place. The mine is not profitable. NOT PRO-FIT-ABLE to exploit layer of coal thick 10 centimeters (conditionally)! And there is not any (another) JOB, near the not-working mine. It’s catastrophe. IT IS REASON. In 70-80th found new well layer of coal in village Vorgashor. Many peoples abandoned our village and left to Vorgashor, I think. Many others (like my father, mother and sister in 1977) left in the middle of Russia, far from the North. Photo 01. It is interesting object. It’s not penthouse. There were not apartments. And it’s not a house for General of Soviet Army or great politicians. It’s our Club, our House of Culture. There was big stage and big screen, and hall with 500-600 places. And other big hall for dancing. We went in Club to see cinemas and visitant artists. Of course, dancing! This Club built prisoners ~17 years (Began in ~1957, finished in = 1973-74). 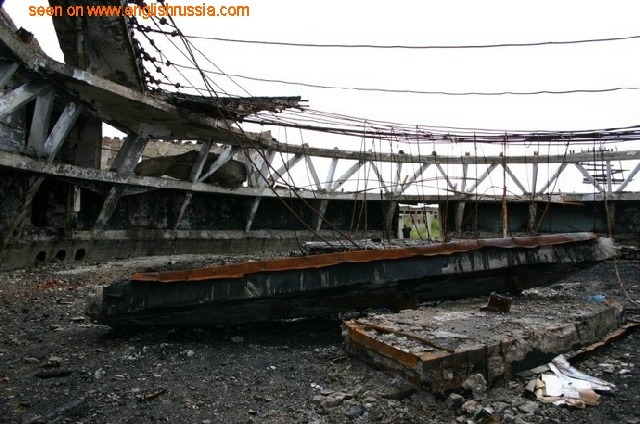 Around building place stood high wooden wall with 6 watch-towers for soldiers with Kalashnikov. Every day early in the morning (winter too) from prison arrived at this place 2 long big cars with 5-6 soldiers, 2-4 big nice dogs and ~ 50 prisoners. I remember, it was interruptions in building about 4-5 years, if more. When I was 7 or 8 years old, sometimes prisoners asked us to buy 1 pack of tea. We was afraid, but sometimes did it. Photo 03. What is the dark spot near the school? There is grass in other places and there is not here. Why? It’s our school football field! Goal sport is absent now. Thousands children trampled down the grass. And I – one of them. Photos 10,11,12. It’s not unknown structure. It’s skating rink. One part of it has round shape. There was ice-floor and round cupola-shaped ceiling. In square part we changed shoes, relax, drank hot tea and lemonade (Coca-cola was absent at that time). And we skated on round ice. Photos of skating rink: 08, 10, 11, 12, 33. Photo 09. It is restaurant. …When I’m sixtyfour…Sorry… No! When I’m 6! When I was 6 my father and mother led me there once. I remember appetizing Kiev-cutlet and snow-white cloth till now. Yes, and I knew “The Beatles” approximately in this time (~1965). And they are my idols up to now. Photos 13,14. It is shop. On 2 floor – Clothes, on 1 floor – food stuffs. Photos 18, 07. Sports hall. Ourselves mounted basketball boards and rings. 3 basketball trainings every week! In the photo 18 (left side) we see small stripe of daylight from the door in photo 07. Photo 29 “Here those students lived in happy families together with their parents.” No! It is a part of our Club. Photos of Club: 01, 04, 28-32, 34-36. Photos of School: 03, 06, 07, 15-27. I don’t want to comment any ravings of a madman about Prypyat and Chernobyl. Thanks to: Oleg (photographer); Daria; administrators of this site; and, of course, all readers. And any more. I am ashamed for those Russian who write any muck on this page. Not all of Russian peoples are the same. Excuse me for them. Undoubtedly far safer than Detroit or any blue city. Have a look for Vorkuta on Google Maps. See how remote and deserted it is? Very few streets? That’s your answer. I guess it was a mining town/city, when the army or mine pulled out, end of city. Happens a lot – loads of ghost towns in the US from the end of the Goldrush or lapses in mining or the depression. Unless you think they should farm the desert? LOL. Great pictures, glad (?) 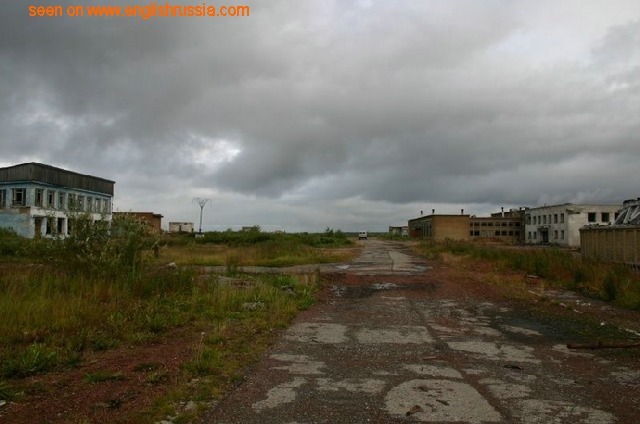 well maybe not glad but interesting to see that there are other ghost towns/cities than Pripyat. Great social, economic or political upheavals always leave white elephants like this. Excuse me, please. You talk rot. It was NOT a closed city. Putin? Gorbachev? What about Stalin? Isn’t he the one who started all of this? Where’s the blame for him? By the way, beautiful pictures and a beautiful country Russia is! Igor, thank you for everything that you wrote. You mentioned that you have black and white pictures from when you were young, back when the city was busy with people and lots of activity. Could you possibly post those pictures? Thanks! Yes, it does look like Detroit, which is basically a ghost town. Exactly; although, this city actually has a future, unlike Detroit. Looks a lot like Cuomo’s New York too, or what’s left of it. Hey, maybe it IS the little dictator’s state after all! this is a very nice and informative site but i want to get the news about this site specially. I lived in Severnyy (“Northern”) town near the Vorkuta. But it’s still alive. I like your captions, it’s just sad to see this place get abandoned like that.